When you're stocking up on screen printing supplies, some of the essential items you often need is split liner tape and pallet tape. 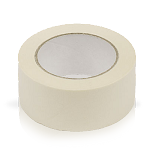 Split liner tape is used to teporarily block ink from smearing out of the wood or aluminum frames, rollers, and other equipment during the screen printing process. Pallet tape which is also called platen tape is used to protect pallets and platens from spray tacks and adhesives for the screen printing industry. We offer multiple sizes to meet your needs. Notice, our rolls are 100 YARDS long.. compare that with the more expensive 100 foot long rolls on other sites. We have the lowest prices on pallet (platen) tapes. Typically, you use pallet tape to protect your screens while you're printing. 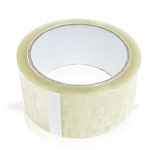 As this tape is specially designed for this task, it's more effective than using duct tape, painter's tape, or other type of tape. When ordering, make sure that you order the right size of tape to go over your pallet. Then, smooth the tape down over the pallet. Generally, when you use pallet tape as a platen covering, you can use it multiple times before you need to change it. As a result, a roll of tape can last a relatively long time even if you do a lot of screen printing. To apply pallet tape, pull a few inches off the roll. Then, center that over the edge of your pallet so that it's lined up perfectly. Smooth the tape as you apply it to remove air bubbles and prevent wrinkles from occurring. Then, slowly pull out more tape and continue to press it down on the pallet. Once you have covered the entire pallet, you can cut around the tape so that it's flush with the edges of the pallet, or you can wrap the tape around the edges. Most printers have a strong preference for one option over the other. To find out which style you prefer, you may want to experiment with both options. Once you've covered the whole pallet with a protective layer of pallet tape, you may want to use block out tape. 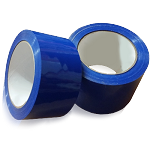 Often colored blue, this tape helps to prevent ink from moving into unwanted areas. You can apply it to the sides of your frame, the corners, or anywhere else where you don't want ink to appear. If you have a registration mark on the pallet to "sign" your work, you may want to avoid putting block out tape on that. Instead, you may want to use transparent tape in these areas. You can apply block out tape directly to the pallet, or you can put it over pallet tape that you're using as a platen covering. If you don't have screens or if you're simply looking for some new products with which to experiment, you may want to invest in masking tape in addition to pallet tape. You can apply masking tape directly to fabrics, and then, you can print a variety of patterns even if you don't have traditional screen printing supplies. After printing your designs, the need for tape is still there. If you want to package and ship any of your products, you need to box them up, and to seal the box, clear shipping tape is essential. To order pallet tape or any other type of tape, put in an order today. If you have questions, contact us directly at American Niagara.